Why I don’t recommend conventional dairy. Homogenized literally means to alter the fat, or emulsify the fat. As we have established fat is pretty important to babies. Even the whole milk, full fat milk, at the store has been through this. Therefore the fat they are getting from homogenized milk has been altered. Pasteurized literally means they heat up the milk so high with intentions to sterilize it. Basically cooking it on really high heat. The process kills any bad bacteria that might be found in the milk. This damages all the vitamins, denatures the proteins, and kills all the good bacteria. The good bacteria in milk would be what you probably know as probiotics. Non-organic milk is full of hormones and antibiotics. The cows are given hormones to make more milk, something I in a weird way can relate to after breastfeeding! They are also given antibiotics because so many of them live in one place, think college dorms. End result all this “stuff” is in your milk. Milk production is one way females (in general, but cows in this case) detox hormones out of their system after having a baby. You better believe all these synthetic hormones are in their milk. You see where I am going? This milk is not what you think you are getting. So why don’t we use something that does have a quality that we are comfortable with? I must make a note on raw milk here. This is organic milk from cows that isn’t homogenized or pasteurized. Some states do not allow this to be sold, while others have it on their grocery store shelves. If you have access to this from a reputable source, all the problems I mentioned above can be avoided. Find out more about raw milk at the following website. We are about to get into the details of different kinds of nondairy milk and how to make them. I do want to take a minute to tell you that homemade is always going to be more nutrient dense. As you can imagine the stuff at the store is watered down, sugar can be added, and some are even fortified. Homemade has more fat, vitamins, and minerals. The options are really endless on what you can buy as far as dairy and nondairy products go. Just take the time to read the label. If you decide to go with organic dairy milk be sure you understand exactly what you are getting. If you’re buying this every week you want to be sure what you are getting is worth the money you are spending. Nutrients: Think of this similar to the nutrient’s of almonds. Almond milk doesn’t have the same level of protein as cow's milk. It also doesn’t have cholesterol or saturated fats. Almond milk does contain monounsaturated fats and tons of vitamins and minerals. How to buy at the store: Look for unsweetened. We don’t need any added sugar in this milk. For sweetened milk you can add two dates or 2 tablespoons of maple syrup. Soak the almonds overnight in water. You can do this on your counter, just be sure all nuts are covered in water. In the morning, strain the nuts and rinse them well. Put the almonds and all other ingredients in a blender. Blend until liquid. Next you need to strain through a cup towel, cheesecloth, or a nut bug. Strain into a bowl and serve. Nutrients: Cashew milk is very high in vitamin K, which is a rare but important vitamin. It helps with injury healing, bone development, and supports calcium uptake in the body. How to buy at the store: Look for unsweetened. We don’t need any added sugar in this milk. This is expensive. 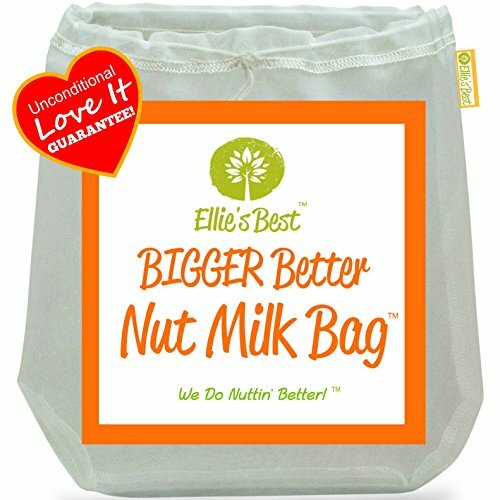 A large gallon that is comparable to almond milk pricing is not possible. Check the labels and be sure it is not something else actually in the container. Soak the cashews overnight in water. You can do this on your counter, just be sure all nuts are covered in water. In the morning, strain the nuts and rinse them well. Put the cashews and all other ingredients in a blender. Blend until liquid. This comes the closest to the creaminess of whole milk, out of all non-dairy milks. Nutrients: Coconut milk actually has more calcium than cow’s milk. It is high in fat, think about it coconut oil comes from the same thing. This particular kind of fat is saturated fat, what is found in animals primarily. Coconuts are the only plant based form of saturated fat. Heat water on the stove top. You want it to be warm, but you don’t want it to be boiling. Put the cashews and all other ingredients in a blender. Blend until liquid. Note: be careful if your blender is air tight. The steam from the water might create a vacuum. Just leave the lid cracked. You now need to strain through a cup towel, cheesecloth, or a nut bug. Strain into a bowl and serve.